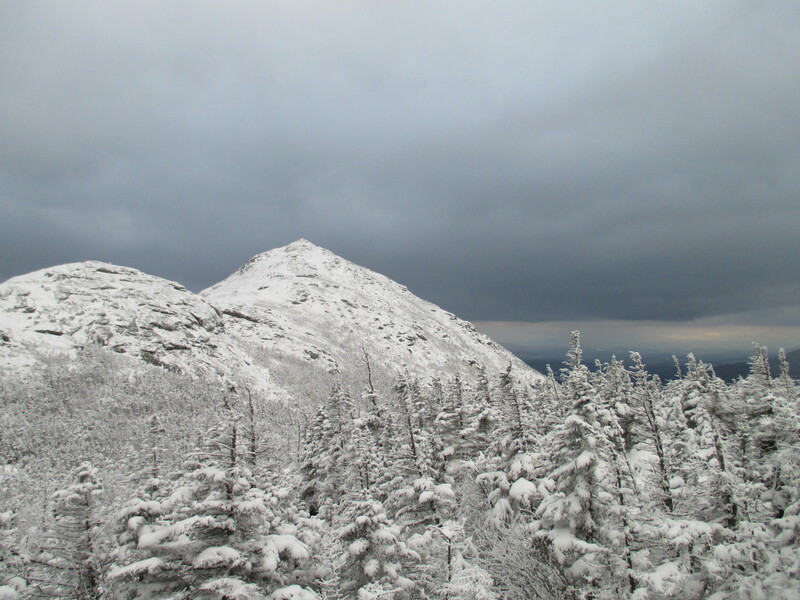 At 7:15 four hikers departed the High Peaks Information Center parking area bound for Skylight and beyond. Sporting various spikey implements (including brand new Hillsounds for Alistair) we marched to the summit of Skylight in 4 hours, sharp. 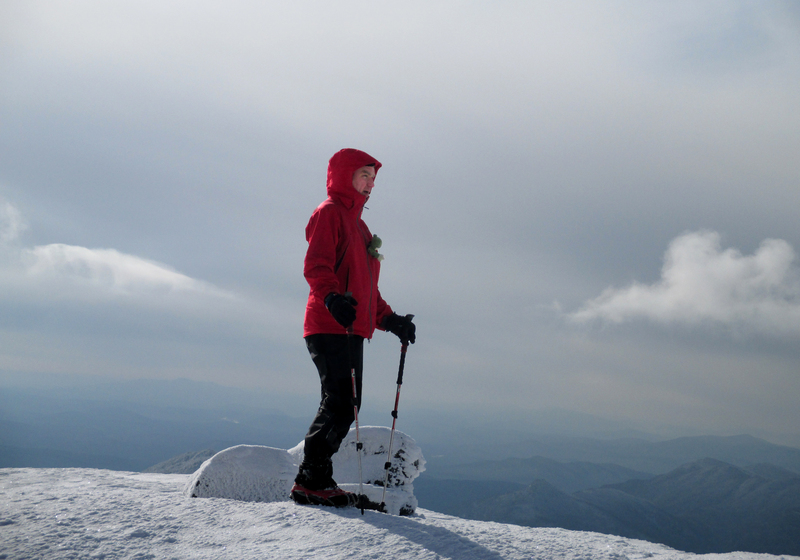 The wind was calm, skies were blue, the mountains were covered in fresh snow and the views were extraordinary. 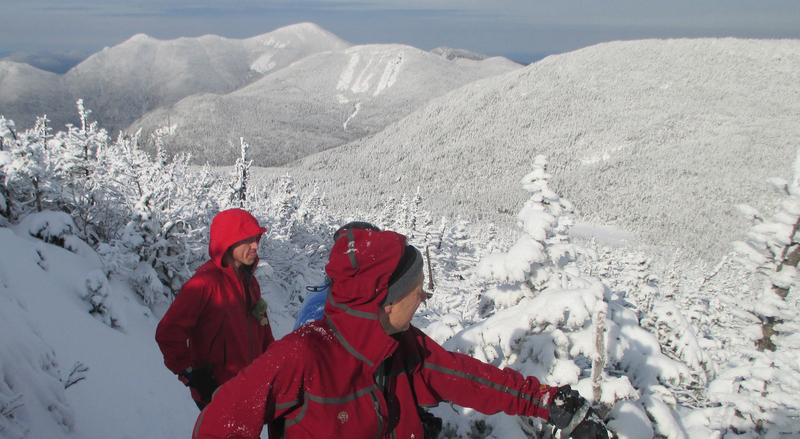 Hitting the highest of the high peaks over and over has been a theme while I whip myself into shape for February 18th. I never tire of the views, especially in winter. On the flanks of Mount Skylight. “Topogothics” and sky on Skylight. Back down at 4 Corners (descent rate in excess of 100 feet/minute according to my wrist altimeter) it became apparent that half our team was “sans raquettes”. 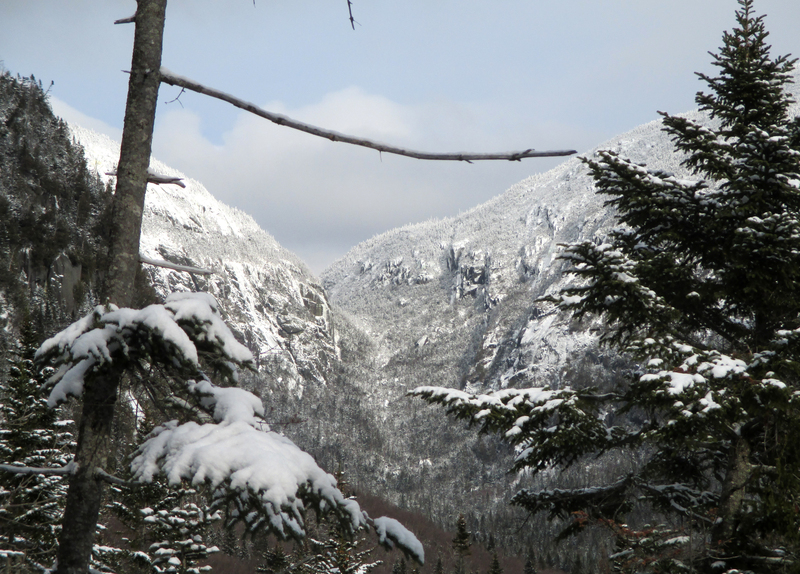 Eschewing Marcy, Boghollow and I went first towards Panther Gorge to pack down the snow for the others. Within a minute it bacame obvious that 8 miles of post-holing would not make for a fun outing so Alistair and Topo turned around. That left me and Boghollow to follow a faint set of tracks that gradually bore witness to someone’s miserable post-holing experience all the way to Panther Gorge and up to Bartlett Ridge. The skies clouded over and the lighting on Haystack and into Panther Gorge created a beautiful luminous glow. The post-holes turned up Haystack (looked like two sets) and we carried on over Bartlett Ridge and down and down a beautiful trail to 2300 feet (Sky = 4900). At the junction of the Bartlett Ridge and Snowbird trails we turned left and began a long and very pleasant climb up between Haystack and Basin. We were gradually completely circumnavigating Haystack as we made our way to Basin. Excellent views of the Johanssen Face and I gave Tom a visual tour of the two climbs up that Face that Glen and I had done. We discovered that as the trail grew steeper and the snow got deeper that our progress slowed down while our effort increased. The ladders and steep pitches were ice encrusted and my Northern Lite snowshoes required cajoling and muscle power to get a grip. Mount Haystack and lowering clouds. We made it to the Range Trail (now back up at 4000 feet) at 3:15 and although the sign said 0.8 miles to Basin it looked very far away. Not only that but it was in the wrong direction. I asked Tom how he felt about coming back down the ice of Basin in the dark and, like me, he was not waxing enthusiastic about that prospect so we decided to do Marcy instead. But first we had another 600 feet up to the Haystack junction and this we did after switching to crampons for «trail bite». Half way up we stopped and chatted (long enough to begin shivering) with three guys from the big city who were on their way to spend the night at Snobird. Up at the Hay junction we ran into a gang from an ADK hike and Tom knew half of them. Forum member Cecilia was there in addition to a newly minted 46er-W. Another long chat and another flirt with hypothermia later we were on our way to the Van Ho. Yet another climb of 800 feet after the descent from Horse Hill but we crushed that one while observing the rapidly changing light on Basin. Now we were very glad not to have done it. At 4:45 we began a 30 minute round trip to Marcy that was very interesting. It socked in very fast, the wind kicked up and it began snowing – just like that (snaps fingers). We consulted with one another and decided it would be OK to keep going up (foot trail in the snow very obvious) but if it began to snow hard we’d turn around. 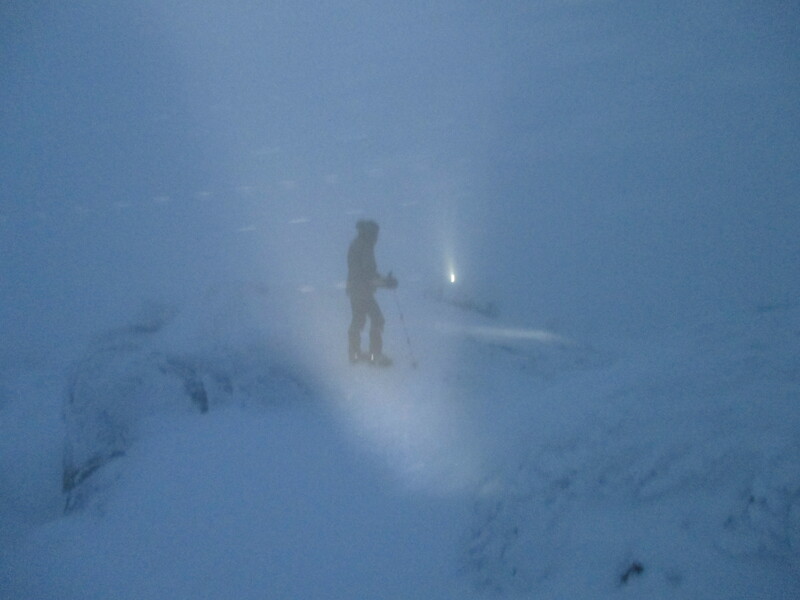 It was foggy as well and at a strategic cairn I placed my extra headlamp so we would see it on the way back. I also took a compass bearing. All of that proved unnecessary and after switching to microspikes back down at the Phelps trail junction we continued on. 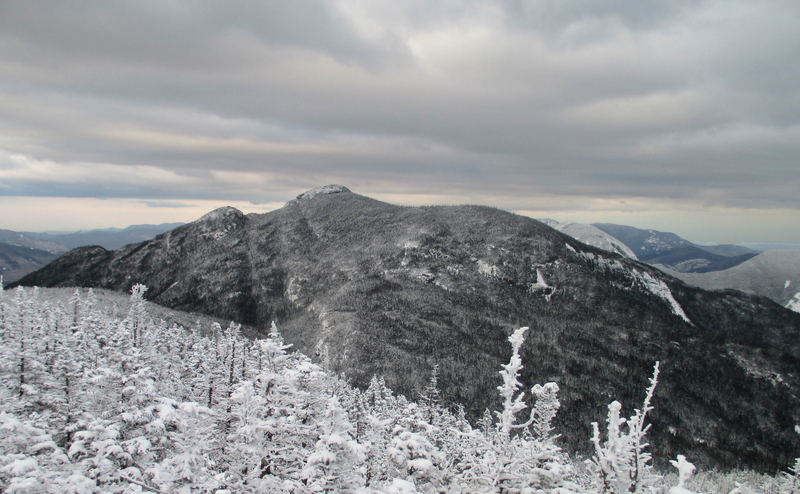 We tore down the Van Hoevenberg trail to the Phelps Mountain Trail junction whereupon we slowed down to a reasonable and pain-free pace and enjoyed the stroll out in the winter wonderland that was ours for the day. Below the Phelps trail junction we bumped into a guy who was heading up. He had climbed the Trap Dike earlier and seemed as cool as a cucumber and said he was just taking things one step at a time and he would see if he went all the way to Marcy or not. Earlier on, at Horse Hill there were two guys without snowshoes who were trying to figure out how to get to the Uphill Brook Lean-to and they seemed to plan on going over Haystack. A descent off the cone of Haystack towards Panther Gorge in the dark with blowing snow and fog, followed by hours of post-holing to 4 Corners was not something I would relish before a night of winter camping. Over and over again Tom and I mentioned how Alistair and Topo had made the right decision to turn back at 4 Corners. Man you guys are machines! all I can say is WOW!